Discussion in 'Forum and Server Announcements' started by BiGUNMAN, Aug 2, 2016. A lot has happened since our last article update! Granted, it was over a month ago. 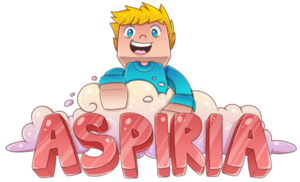 Speaking of months, 48 months ago, or four ago Aspiria MC started, and here we are today. Okay, way too much text, lets start listing new features! Claiming to the Nether and End will be added soon, you'll be able to purchase the ability to do so with coins. The main end island has been protected. You can still farm the obsidian pillars, destroy end crystals and spawn the dragon using end crystals. We added and removed mob merging (we were getting stacks of over 1 million, so we removed it). Upon joining the hub the server selector menu opens. We've added a leaderboard, just use /leaderboard. Disguises have been fully fixed for donors and the menu has been updated. Particles /trails for donor ranks have returned. Particles for donors that have purchased the "Trails Pack" have been improved drastically. Using /trail or /particles you can now open a significantly improved trails pack. They are so much cooler! A leaderboard with heads was added to the side of the pvp zone. We've added messages in the boss-bar, which notify you about all kinds of tools, like /market, /trade, and so on! We've also added action-bar messages and "Featured" chat messages which tell you about new things and certain commands. Our Anti-Cheat system has returned! And its better then ever! An Anti-Xray system has been implemented. New buddies have been added, you can win buddies with a "Buddy Key". We've added new things to the store! Special Keys that give can give you buddies, pets and disguises. We've also added "Buddy Keys" in which you can win a buddy. We've decreased the prices of "All Mob Disguises and All Pets" to $30 (these are pets and disguises not included with your rank). King of The Hill - Was added to the pvpzone. You need to purchase a package to start one. Their will be a SOLO and Teams of 2 Event. The top 3 players in the SOLO event and the winning team in the Teams event will receive a prize. We just want your guys' opinion and some of these things! Come vote. There is so much more coming, it's know you guys are enjoying what we've done so far! Good luck and have fun! Great update Big! Excited for all the events coming! I cannot see the link to enter the contest. BiG, where are you taking Aspiria for the 4 year anniversary?! I think she would love Olive Garden! *COUGH* Oldtown *COUGH* happy birthday Oldtown :3.......#OldTownRebels!! !